Earthquake in U.S. This Weekend? Well praise Jesus I am still here. Yes I was hoping to get “beamed off this rock” over the last couple days. Deep down inside I wish I was with the Lord, but we have a responsibility to “buck up” and “keep on keepin on”. We have a responsibility to participate in the harvest as best as we can. Plant seeds. Plant lots of seeds. I just got off the phone with Kenneth. What a burden it is to “know what we know” and still function in society. And to make matters even more frustrating, all we know is that “time is short” but we really don’t know “how short” … Amen? We don’t. That is frustrating. Is “all heck” going to break loose this month? I don’t know. Might the “rescue mission” happen this month? Don’t know. Do we have to endure a “crescendos of events” and various geological calamities while we wait? Probably. Does it rain on the just and the unjust? You bet it does. Just last night I was talking to Jonathan on the phone. I told him if half these predictions about earthquakes in the United States are true, then I might not make the “rescue mission”. I told him it’s possible my “fleshy body” might be “boogie boarding” to the Ivory Coast in Africa. Frankly I really don’t care either way. Yes I do pray to the Lord that I am found worthy to escape all these things, but this is God’s “movie” and we are blessed to be invited to take part in it. Would I rather be “rescued” and “whisked up” in some type of Elijah-esque “whirlwind” of sorts, absolutely. Do I realize something bad could happen and I get there in a “less graceful” manner …. sure. What a fascinating paradox. I imagine there isn’t a single one of us that would prefer to go back into the “ignorant fog of the churchianity matrix” and risk our “state of imminence” and potentially jeopardize our salvation / Heavenly inheritance. Amen? But DARN IT … this waiting and watching stuff is HARD. To “set the stage” for today’s article, it’s probably important to review a couple data points from the article entitled “2011 Slight of Hand”. It’s important for us to fully embrace the messages woven into this “vision”. Note that the chapter title includes the words “Drastic Weather Change“. If you research John Moore’s work entitled “Global Warming What the Government isn’t Telling You” on You Tube, or spend the money on his DVD lecture entitled “Signs in the Sun, Moon, and Stars“, you will hear him do a “bang up” job explaining the concept of “Sudden Catastrophic Climate Change”, complete with government Intel proving “they know” what is coming / already here. You see, Mr. Moore, like Lucas at www.rabbithole2.com/video.htm does an excellent job explaining how Planet X, which has been heading this way for arguably thousands of years, would be the cause of the lie of “Global Warming”, which would more accurately be described as “Sudden Catastrophic Climate Change”. Moore really does do a very good job pulling all this data together and includes his own research of more than 30 years on this subject. When you combine Moore’s work with Lucas’ work, you have an excellent blend of both Christian-esque vs. non-christian perspectives with volumes of data that clearly prove we are dealing with a “Brown Dwarf” problem that is going to get “much much worse” on short notice. But it’s also VERY IMPORTANT you take note that David Wilkersons’ prophecy suggests a horrible earthquake calamity in Japan followed promptly by the worst earthquake in the History of the United States. While the world is focused on the horrible situation unfolding in Japan, much of the “end of the world intelligence” has slowed down. Sure the same old “Alex Jones” / “Drudge Report” stuff is out there as usual. But the really interesting “intergalactic” / “cosmic stuff” has leveled off a bit. I’ve received a number of phone calls and emails that things were once again “pretty quiet”. I’m the type of guy that “needs” to be busy. While a number of “You Tubers” had predicted a “March 15th” pole shift of some type, March 15th turned out to be one of the most quiet days I can remember in the last 5 years. It was my birthday. No big deal there. Frankly I really don’t pay attention to that day any more. My daughter and her husband went off to a friend’s lake home. They have a boat and there was another birthday to be celebrated. So I sat downstairs and watched the news. The Neil Cavuto show comes on Fox. After hours of listening to updates on the “reactor” containment issues in Japan, Cavuto announces Jim Berkland as a guest. Evidently Jim Berkland is famous for successfully predicting the “World Series Earthquake”. My interest is now peaked. The Neil Cavuto – Jim Berkland Interview Transcript from March 15th. This is what Japan does not need, and imminent earthquake warning just issued for several regions of the country, on edge there, on edge here, because this really didn’t start with Japan, take a look at what experts are increasingly calling the so-called “Ring of Fire” that is circling the entire pacific ocean. Do you remember Chile’s massive earthquake about a year ago, and you had that big one in New Zealand just last month, and of course Japan, and if this clockwise trend continues, my next guest says, North America looks to be on tap next, don’t laugh, Geologist Jim Berkland, is worried and when he worries, you should worry too. Jim accurately predicted, get this, the 1989 so-called World Series Earthquake, four days before it shook the San Fancisco Bay Area. And Jim says “this month” is of particular concern. The months of October, March and April are the three most devestating earthquakes in terms of damage in the San Francisco Bay area, in history. (Berkland worked at the U.S. Geological Survey for six years). And we’re having, on the 19th of this month, not only the full moon, but within an hour, the closest approach of the moon until the year 2016. And the next day, is the equinoctal tide, bringing together three of the maximum tide raising forces, and we know about the ocean tides, but there’s also an “earth tide”, and there’s a tide in the ground water, and all of these help to release sudden built up strain, and cause earthquakes. But that could seem to imply that we are looking at a very imminent event in the United States, within the next, (Niel cringes his facial expression), week or two? Yes, what I call a “seismic window”. The top “seismic windows” in years, is developing this month, and this is a 7.0 monster, and it says that geoglogists was warned about it, and a week earlier they were talking about the tides, and not to worry about the really high tides coming up, (Jim Berkland is holding up copies of News Papers). Well I think there’s worry, ahh, here too. Uhmm. Well let’s say here, well, you’re a genius, I’m not, so I just want to follow your fine brain on this. What you’re saying is, that there is a certain order to this even though, it doesn’t appears as though. For a lot of folks, this seems like random events, but your saying there is a process unfolding here, for California, Oregon, or whatever. What would that mean, what type of quake or distrurbance or distruption would that be? What is that message, when you have events like that, what does that generally mean? What’s going on in the waters? The changes, changes in the magnetic field, that often precede larger earthquakes, most animals, have the mineral magnetite in their bodies, including people, but it causes homing pigeons to enable them to get home, just before big quakes they often can’t get home, so there’s a delay factor … and ahh, so we look for those kinds of things. Just before the World Series Quake there was a very unusual beaching of a rare, ahh beached whales, in a beach in San Francisco, and after that an equally rare pigmy Sperm Whale washed up at Santa Cruz up at about 5 miles of the center of the World Series Quake, and that kind of beaching had never occured before, nor since. So we’re looking for strange fish, coming in from deep water, shallow water, ahh, wild animals coming into cities. Uhmm. I used to just scoff at these kinds of things because I was a mainstream geologist, until I found out that earthquakes are fitting a pattern, ahh the big earthquake in the Indian Ocean followed the most massive beachings of whales in ahh Taiwan, no ahh not Taiwan, but ahh New Zealand, and Australia, and ahh … Tazmania, and within a couple of days, they had an 8.3 South of New Zealand, adn then came a 9.1, in the Indian Ocean with the big tsunami on the very day, of the full moon. The previous big quake and tsunami, was in Alaska, was a 9.2 magnitude event, on the day of the full moon, on the 27th of March in 1964. (Interrupting) Alright so Jim bottom line we have a lot to watch, and believe me your track record, tells us to watch it, well Jim, thank you very much, I hope your wrong, but your record seems to …. … well especially at this time, in world history, its … uhmm … not good. There is a mention of the appearance of what is called by the Japaneses and other Far East civilizations what is refered to as “earthquake fish” dying and surfacing. The species, Trachipterus ishikawae, is commonly called “earthquake fish” in Taiwan because the fish are popularly believed to appear following major earthquake events due to alleged sensitivity to disturbances in the ocean floor. There are records of such appearances following a 100-year earthquake in Hengchun in late 2006 and in Taidong in 2007, as well as the numerous recent March 2010 sightings along the coast of Japan, but other recorded sightings do not correspond with seismic disturbances. 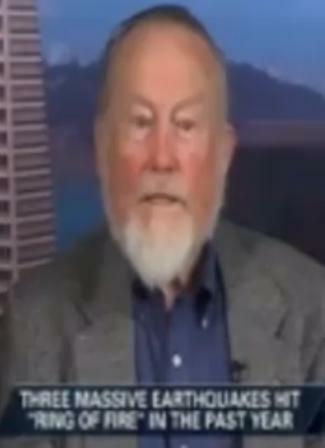 Ken Ring is another Geologist who has made similar predictions. Mr. Ring accurately predicted the recent Christchurch earthquake and has been seen on a number of television news programs. If you do a search on “Ken Ring” on You Tube, you can watch a number of his televised testimonies regarding this earthquake prediction methodology. And you will quickly discover that the indicators Ken uses are pretty much identical to those used by Kim Berkland. In fact, Ken Ring has also predicted this forthcoming weekend (March 19th and 20th) to be an extremely likely point in time for a massive earthquake to occur in the United States. Here is a News Report from “3 News” in New Zealand. While they claim that no mainstream geologists they have asked, would corroborate Ken Ring’s predictions, due to overwhelming requests from their listening audience (in the thousands) they decided to do a spot on Mr. Ring’s predictions on their program. Mr. Ring predicts a major earthquake event to occur on March 20th, 2011. What is interesting is the language used in these Sorcha Faal articles is finding its way onto a number of other web sites across the world with “mainstream-esque” sounding names. The “dead giveaway” to these “Sorcha Faal” type articles is this highly incredible nonsense that seems to proceed each of the claims with this suggestion that “reports prepared for Prime Minister Putin by some Russian institute” have all this cutting edge information that is unavailable anywhere esle in the world. Now what IS useful from the “Sorcha Faal” type articles and alleged “news releases” is not so much the conclusions, which have been consistently incorrect for years and years, but the embedded links of data points woven into the articles. So while the “Faal” conclusions are usually “not-so-helpful” the “data included” is great research material and can often be confirmed. Here is a quote from this somewhat interesting albeit dubious source regarding Ken Ring’s predictions. Toss in a tablespoon of Planet X, and a dash of “Elenin” and we have quite the interesting combination of “electromagnetic” catalysts. Yes? And never mind the endless “animal deaths” all over the world. Blackbirds, other birds, fish, wild-life, of all kinds … not just in North America but ALL OVER THE WORLD lately. Amen? Dont’ forget the seismic indicators and volcanoes. Dont’ forget Indionesia seeming to sink slowly into the ocean. The list is HUGE. The following You Tube vision of the Rapture appears to have become very popular recently. I received this vision / You Tube video from a remarkable number of people. God Bless You all for sending this too me. As always, I will transcribe the audio into this article below for those who do not have access to You Tube. I, Michael, am really getting excited and sorrowful at the same time. Texas again was in my dream. I pray that each of who will read this may keep safe in the hands of God’s Son who is our Redeemer and who will come. I heard the Emergency Broadcast System throughout the neighborhood and went in to watch. Fires were started throughout the U.S. The main body of which was caused by an unexpected meteor. The shuttle was forced to land because of the meteor showers. When the burning objects hit the ground, they started oil, coal and gas fires from Texas to Virginia. Events that I saw, but am not sure of their order. Earthquake affecting the East Coast of the United States. Large amounts of water affecting the East Coast. Power outage in scattered parts of the U.S. Starvation within the U.S. Suddenly I was in a very different day. The sunlight was very different and seemed to change within the hour. The dream then changed like someone flipping a page. I saw all the armies of the world look up. Then each one went back home. This is when everything stopped. When I say stop, I mean the … Air … All Fires … Water … All Life … Anything falling stopped in mid-air. Everything stopped. This was the most amazing part of the dream and there is no way to describe the changes with the people that were gathering into groups. They were all so beautiful but nothing I could describe. They looked like pure perfection and were no longer bound by any force on earth. I, myself, could go anywhere instantly. But I remember being attracted to a large blue object sitting above the earth. I felt so incredibly drawn to this object, a huge object. 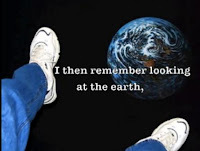 I could hear in my head, someone telling me to “Look away from the earth”. 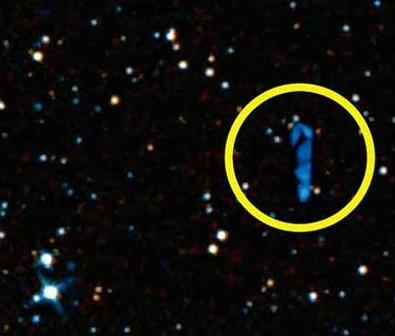 Remember for the last year or so the articles that surfaced on all sorts of web sites about 3 large space ships heading toward earth? 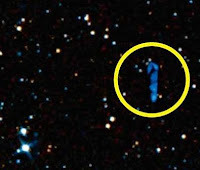 Remember how they were being reported as “blue in color” and estimated to be about 150 Kilometers across in size? Remember how some had claimed that one of these ships was in the shape of a cross? Frankly I’ve been wondering about these supposed “technological transport vehicles” for a very long time. Perhaps it’s only my vivid imagination. Surely you don’t supposed that Enoch and Elijah were whisked up into anything but … well … another dimension do you? Surely a Chariot of Fire MUST be some Roman looking horse and buggy with fire shooting out its “Back to the Future” Flux Capacitor … right? After all the angles in Sodom were trapped in Lots’ house and had to blind the evil doers because uhmmm…. well surely those angels weren’t really trapped in Lot’s house … right? Surely they could have “materialized” into another dimension any time they wanted too … correct? On thing is for sure, things are starting to get REALLY exciting. For those of us wating anxiously for the transformation of our bodies and our return to our King Jesus Yahushua (Yeshua) the Messiah, this is the most awesome time anyone could ever hope for. While I realized that I might not live long enough to make the resuce mission, I feel pretty sure I will make the Heavenly cut. I might not be “first string” but I will be super thirilled to have been found worthy to Stand before my King … Jesus … the Son of Man. There is no other escape. And what is it you believe you are “escaping too”? Do you have dibs on a guillotine for martyrdom? Or were you planning on getting body-slammed by a falling comet?